'Generations' is a collaboration with six European street artists and ten older people living alone in Kensington, London. 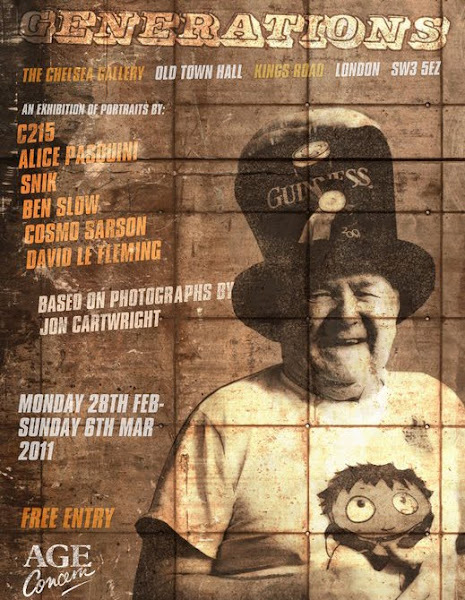 Last year photographer Jon Cartwright took a simple photograph of each subject which were then used by artist C215, Alice Pasquini, Cosmo Sarson, Ben Slow, snik and David le Fleming to create unique portraits of some of London's most easily overlooked residents. The work has been brought together for the Generations show which will run for a week from Monday 28 February - Sunday 6 March 2011.